Barney Smith is on the very rim of the art world. Few men have dared venture into the same realm he has chosen, and none have done so with such zeal. He paints, he engraves, he sculpts, but he always works with the same medium: toilet seats. Eyeglasses, cosmetology supplies, sports memorabilia, cartoon characters, artillery––you name it and he's put it on a toilet seat. He has seats sporting license plates for every state in the union. He's made a seat honoring wooden nickels. Another is dedicated to the Global Positioning System. Yet another stands as a tribute to railroad crossings. There's even a seat commemorating his wife's gallstone surgery (sans the actual gallstone, which his wife has kept hidden from him). And the ideas just keep coming. One of his latest features a piece of Saddam Hussein's own toilet, recovered from an underground bunker in the Green Zone. The whole thing started somewhere around 1970, after Barney returned from a hunting trip with his father. Both came home with bucks and both were eager to display the horns. Barney's dad mounted his to traditional wooden shields, but Barney, who is a master plumber, got the idea to affix his horns to a spare toilet lid. Flush with pride over his inspiration, he realized he had uncovered his new pastime. 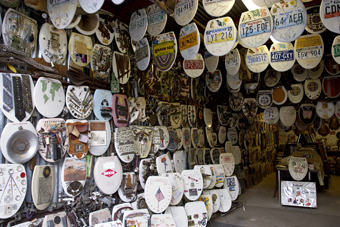 Today, Barney has decorated more than 700 rings and lids, all on display in the garage adjacent to his San Antonio home. And he can tell you a story about each and every one. He will, too, if you've got the time. 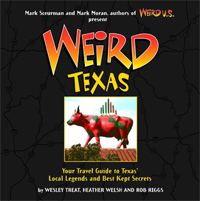 Every visitor is more than welcome to a uniquely tangential tour of his creations, which will cover any variety of topics. It's entirely possible for a person to learn about cosmetic dentistry, the D.A.R.E. program and Japanese currency all in the same visit. 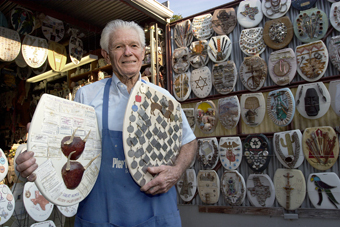 Considering the enthusiasm he displays, it's hard to believe that for many years Barney Smith kept a lid on his hobby. No one was privy to the unusual gallery until 1992, when a man inquired about some of Barney's oil paintings, which he had out during a yard sale. Barney invited him inside to see more, but once the man got a look at the toilet seats, Barney recalls, "He wasn't interested in my oils anymore!" The display has been open to the public ever since. Of course, everyone has to ask him what his own toilet seat looks like. He insists it's undecorated. Besides, he prefers to work with molded wood; for personal use, he likes plastic.